Contrary to conventional wisdom, this link is surprisingly weak. Most kids who abuse animals become normal adults and most serial killers and school shooters do not have a history of animal abuse. (See Animal Cruelty Does Not Predict Who Will Be a School Shooter). Similarly, only a small fraction of people who suffer from depression are vegetarians and most vegetarians are not depressed. 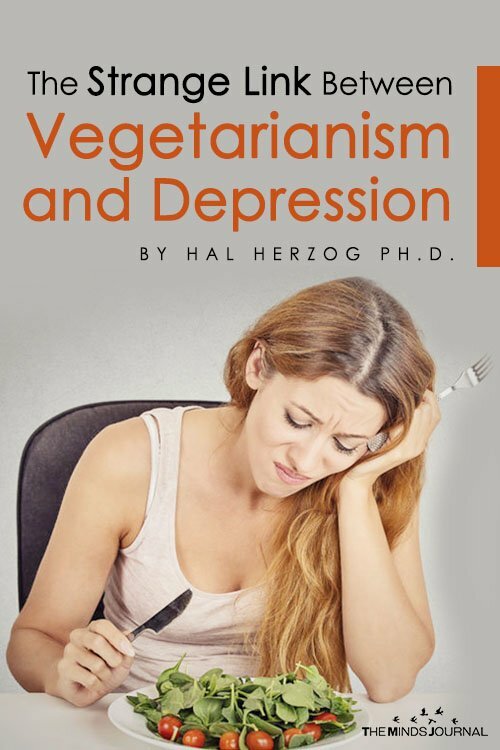 However, the existence of multiple studies involving thousands of subjects by researchers in different countries suggests that the connection between vegetarianism and depression is not a statistical fluke. I can think of a couple of possibilities. First, it could be the case that vegetarian diets actually produce biological changes in brain chemistry, or even the microbiome, that causes some people to be depressed. I am a bit skeptical of this explanation, but the German study mentioned above found that 34 percent of people with depression started on a vegetarian diet before the onset of their mental disorders, compared to 9 percent of people with anxiety disorders. I think it is more likely that some traits may predispose some people to both depression and to vegetarianism. Women, for example, are twice as likely as men to suffer from depression, and there are also more female vegetarians than male vegetarians. And, while the evidence is mixed, some personality types may also be particularly drawn to vegetarianism. 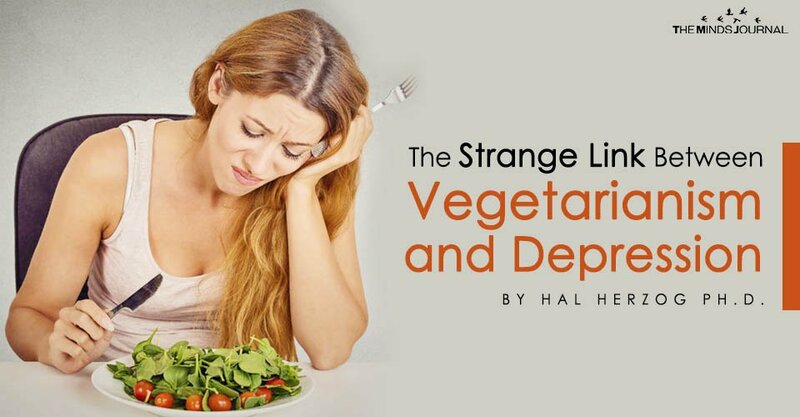 Finally, as several animal activists pointed out to me after this post was initially written, the vegetarian-depression link could be the result of moral commitment. As Lori Marino, executive director of the Kimmela Center for Animal Advocacy wrote on Facebook, vegetarians and vegans are more aware of the cruelties of the world and this is more depressing than living in a state of ignorant bliss. Baines, S., Powers, J., & Brown, W. J. (2007). How does the health and well-being of young Australian vegetarian and semi-vegetarian women compare with non-vegetarians? Public health nutrition, 10(5), 436-442. Beezhold, B. L., Johnston, C. S., & Daigle, D. R. (2010). Vegetarian diets are associated with healthy mood states: a cross-sectional study in Seventh Day Adventist adults. Nutrition journal, 9(1), 26. Forestell, C. A., & Nezlek, J. B. (2018). Vegetarianism, depression, and the five factor model of personality. Ecology of food and nutrition, 57(3), 246-259. Jacka, F. N., Pasco, J. A., Williams, L. J., Mann, N., Hodge, A., Brazionis, L., & Berk, M. (2012). Red meat consumption and mood and anxiety disorders. Psychotherapy andpsychosomatics, 81(3), 196-198. Meesters, A. N., Maukonen, M., Partonen, T., Männistö, S., Gordijn, M. C., & Meesters, Y. (2016). Is there a relationship between vegetarianism and seasonal affective disorder? A pilot study. Neuropsychobiology, 74(4), 202-206. Michalak, J., Zhang, X. C., & Jacobi, F. (2012). Vegetarian diet and mental disorders: results from a representative community survey. International Journal of Behavioral Nutrition and Physical Activity, 9(1), 67. Timko, C. A., Hormes, J. M., & Chubski, J. (2012). Will the real vegetarian please stand up? An investigation of dietary restraint and eating disorder symptoms in vegetarians versus non-vegetarians. Appetite, 58(3), 982-990. Hal Herzog has been investigating the complex psychology of our interactions with other species for more than two decades. He is particularly interested in how people negotiate real-world ethical dilemmas, and he has studied animal activists, cockfighters, animal researchers, and circus animal trainers. An award-winning teacher and researcher, he has written more than 100 articles and book chapters. His research has been published in journals such as Science, The American Psychologist, The Journal of the Royal Society, The American Scholar, New Scientist, Anthrozo's, BioScience, The Journal of the American Veterinary Medical Association, and Animal Behavior. His work has been covered by Newsweek, Slate, Salon, National Public Radio, Scientific American, USA Today, The Washington Post, The Boston Globe, The Chicago Tribune and many other newspapers. In 2013, he was given the Distinguished Scholar Award by the International Society for Anthrozoology.